Annisquam Herb Farm: Make your own rosewater . . .
Make your own rosewater . . . It has been cool this Spring but the roses are blooming. Now is the time to think about capturing some of their wonderful scents for your own rosewater. One way is to distill the petals. But there is an easier way to make this wonderful facial toner. Remember to only gather plant materials from chemical-free gardens and away from the roads where the plants are exposed to exhaust fumes. Here is a quick and easy recipe by Janice Cox from her book Natural Beauty at Home. Place rose petals in a ceramic or glass bowl. Use only fresh petals (no leaves or stems). 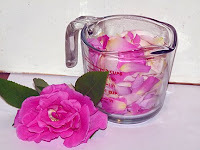 Pour boiling water over petals, and allow petals to steep until cool. Pour the scented liquid into a clean bottle. This recipe was published on The Herb Companion, a wonderful, free newsletter.